Growing up is rough. We all know that from our own lives and watching our youngsters deal with the troubles of being a kid. The shows that we all have available aren’t helping, either.Pokémon heroes are off to change the world as early as 10 years old.Naruto ninja warriors are battling other classes at 12. Even the Lego squad are recruiting for the new waves and, meanwhile, we’re still waiting on our tragically delayed invitations to all the cool stuff. That won’t stop the kids from racing forward. And, if we let ourselves forget for even a second, they are sure to remind us! They’re racing to grow up faster than we’re prepared and they are intent to get there as fast as they can. What is a parent to do but try to find a compromise? How can we let the kid grow up and still be a kid!? And, let’s be honest, how can we relive some of our youth through them? 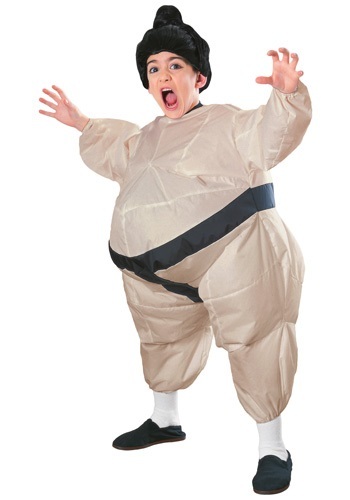 The solution comes in the form of the Child Inflatable Sumo Costume! With the power of wind, you can transform your kiddo into a larger-than-life ninja wrestler, ready to take down all opponents and take on the persona (and size!) of an adult while you can still keep him or her at least at the same height for a little while longer. Make a game of inflating the suit with a small fan and continue the fun with a safe display of your new Sumo Wrestler’s “intimidating” stomps. May you both live the fantasy of adventure while you can, and this way do it together!